Yes, things are turbulent, but it’s nothing you can’t handle. This is the moment you recite that Shakespeare speech about showing off your battle scars on Saint Crispin’s Day. Okay, it’s not Shakespeare, but it still gets the point across. By the way, Kabbalists call the Seven of Wands tarot card the Lord of Valor. It’s time to get busy. There’s a lot to do. “Conflict is certain, but victory is not.” wrote Arthur E. Waite. Oh, really? Waite could be a negative ninny at times. You’ll only fail, if you really want to. Astrologically, Mars in Leo is giving you incredible amounts of strength and courage. Visually, it’s clear that the young man in the Seven of Wands tarot card holds the high ground. The white cliffs show that it’s moral high ground, as well. Yes, he’s outnumbered six to one, but so what? The staffs below can barely reach him. The young man in the Seven of Wands wears green, orange, and yellow. Green is associated with Venus and the passion with which he fights. Solar orange symbolizes his strength. Airy yellow represents quickness in thought and action. Talking about quick, the man in the Seven of Wands had to get dressed in a hurry. He didn’t even have time to match his shoes. Some days are like that. His stance shows stability and constant motion. As you can tell from his expression, he is facing his enemies with fierce determination. The position of his arms is interesting. It’s the same as that of the Magician in the Major Arcana. If you are in touch with your power and you’re not afraid to use it, this skirmish will be over quickly. Fortune favors the bold today, and when it’s all over, you can carve six more notches into your belt! 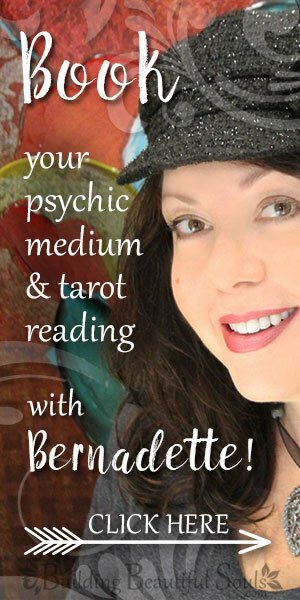 When the Seven of Wands tarot card presents itself upright in a tarot reading, it’s a sign that now is your chance to show the world what you’re made of. If things are heating up around you, it’s because you’re red hot. You’re on fire, kiddo! Oh, there are challenges galore, but knowing you have what it takes and being quick on your feet will leave you covered with glory once the dust hast settled. All you need is perseverance and a little faith in yourself. In the heat of the moment, it can be easy to forget that you already have the advantage. The trick is to get the job done, no matter what. Don’t waste time on minor details. The barbarians are at the gate. Give them a good whack on the noggin, and they’ll stop laughing at your mismatched footwear. In business, you may be faced with stiff competition, but you are well-positioned. Don’t let anyone intimidate you. You have the skills and know-how to deal with anyone who’s trying to step on your turf. If you’re competing for a promotion at your workplace or an ambitious project that could lead to one, chances are your superiors have already pegged you for it. They’re just curious to see how you’ll handle yourself under pressure. 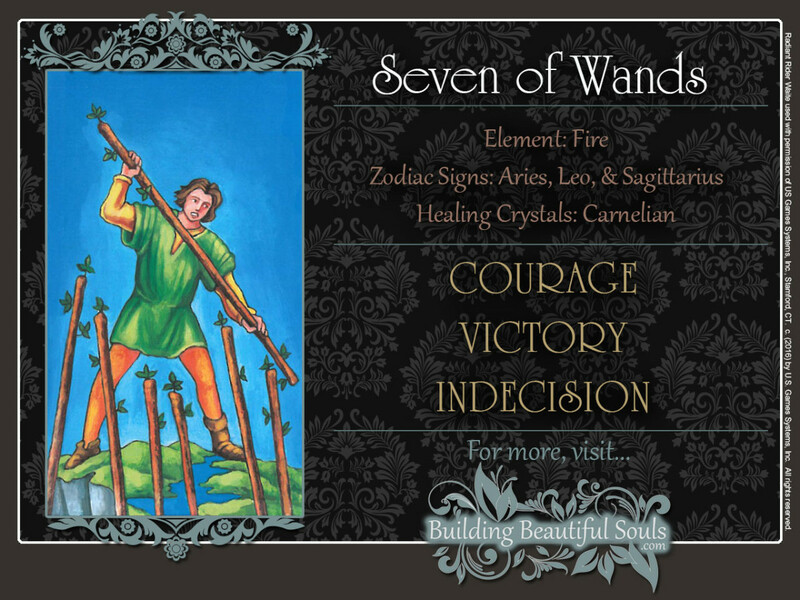 The Seven of Wands tarot card also indicates an important inner victory. For example, if you’ve been struggling with depression, you will find the energy and resources to beat it. It could well be that you have discovered you’re much stronger and wiser than you thought. Former lovers may have told you that you’re an ugly loser. That’s what they do. But now you’ve found out that’s not true at all. Why else would so many of your single social network friends start flirting with you, now that you’ve changed your relationship status? Others can learn a lot from you. In fact, the Seven of Wands is also a card of knowledge and teaching. Have you tried sharing your story with others? Chances are, you’d be a captivating speaker or writer. If you’re thinking about changing careers, you may be facing an uphill battle. But don’t let that stop you. It takes time to master a new skill set. Perseverance will see you through. When the Seven of Wands card is reversed in a tarot reading, it warns you that you may be sabotaging yourself. Look inside and take stock of your emotional household. What’s driving you to continuously shoot yourself in the foot? The most likely culprits are fear and shame. If you allow them to guide your thoughts and actions, they will surround you with drama and put you in high-risk situations. Why? To distract you from dealing with important personal issues. Is shame preventing you from seeking the help you need? Are you overly concerned with other’s opinions? Are you backing down and giving in to what other’s wants and needs rather than standing your own ground? Sometimes, fear can keep us from making important decisions when time is of the essence. When the Seven of Wands tarot card is reversed, it reminds us that quick action is needed before a potential crisis spirals out of control. Inverted, the Seven of Wands tarot card calls on us to gather our confidence and get a move on. Any action is better than doing nothing at all. The light has turned green. Turn right, turn left, or go straight – but move! You really don’t want to find out just how loud those dozen or so car horns behind you can get. Always remember that whatever troubles you are facing you, you don’t have to face them alone. The Seven of Wands tarot can also warn us that we are driving people away with our aggressive behavior so back off a little in relationships and you’ll find the support system you need to help you get through this rough patch. Kabbalistically, sevens correspond to passionate Venus. In traditional Numerology, 7 is associated with the vast, untapped energy reservoirs of Neptune. In the Suit of Wands, their combined forces show your potential to overcome great obstacles.